Now that summer is unofficially over around here, dh and I have decided to get back into an exercise routine. First, we'll be starting a yoga class together. Flexibility has always been a big issue for me. Way back in junior high, after the first year my gym teacher quit making me do stuff during the gymnastic segment and had me just walk around and spot other people. After my hamstring injury last year, stretching has become much more important as I'm not wanting to go through *that* again! Next, we're going to combine our fitness goal with another goal of spending more time with the kids and less time staring at computer screens. We're going to spend 30 minutes per night doing something with the kids. Four nights a week we're going to make that something active: biking, hiking, kayaking, playing basketball. Anything that gets us out there and moving. The other nights might be spent watching a family movie or playing a board game. It's sad but when you have four kids, involved in four different activities, you can get to the end of the weke and feel like you haven't seen each other in days. Hopefully this will help us re-connect as well as set a good example to the kids of how to maintain a healthy, active lifestyle (not to mention developing good time management skills!). After our inaugural family bike ride, I made homemade pizzas for the kids. Since I had a bit of leftover dough, I decided to re-create an interesting recipe I'd come across earlier in the week: Catalan Coca with Sweet Onions, Piquillo Peppers, Olives & Aged Manchego Cheese. After seeing the gorgeous photo over at Chefs Gone Wild, I had to read further. 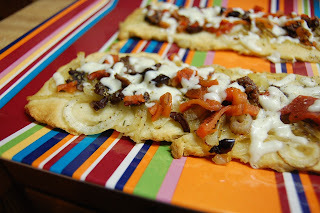 Apparently Catalon coca is a sort of flatbread pizza-like cocoction popular in the northeastern part of Spain. This incarnation combines peppers, olives and cheese with the salty bite of anchovies. I had to change the recipe a bit to use what I had on hand. You can find the original recipe, as well as step-by-step instructions and photographs at Chefs Gone Wild. Caramelize onions in olive oil. Divide dough into four balls. Roll each ball into an oval shape and place on a prepared baking sheet. When onions are soft and brown, divide them between each of the dough ovals. Top each with oregano and chopped olives. Bake in 400 degree oven for 8-10 minutes or until edges are browned. Top with red peppers, anchovies and cheese. Return to oven for two minutes or until cheese has melted and topping are heated through. This looks great. I've never heard of this coca before.